For instance my last update on the stock market at the start of 2018 concluded in expectations for an imminent correction towards Dow 23,000 from the then lofty level of 24,700. So take this as another warning to lighten your stock holdings as I will continue to do so as to limit the damage done when the SHTF. 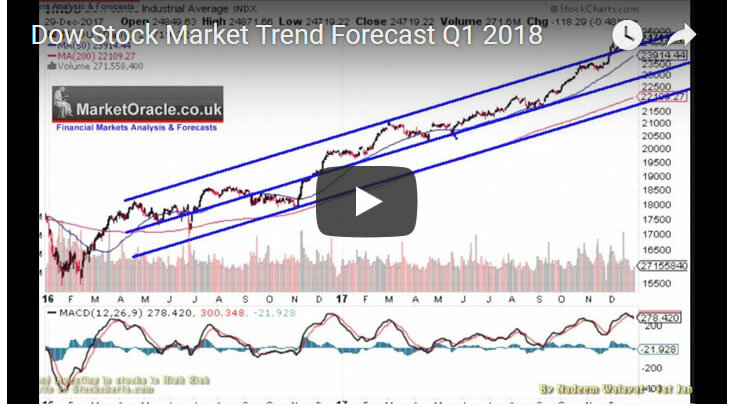 And ensure you are subscribed to my always free newsletter and youtube channel for my forthcoming in-depth analysis and detailed trend forecasts. Your worried bearish stocks bull. 03 Feb 18, 05:30 Just in time! I love your insights into stock market and following you for last 8-10 years. The comment you made on 01/23 clearly reflects irrationality built into current market behavior and indicates how close it is to for a well deserved correction. AND FINALLY MARKET yields and starts the process from 01/28 and followed through on Day5 on 02/02. (hopefully!!) We will see how it unfolds next 2-3 months. Yeh, I should could have should have done it, but didn't, neverthless I have been bearish for the prospects for stocks this year. Will do a semi-indepth analysis shortly, after I take a look at bitcoin.